Pruitt had a shiny new talking point to roll out on the Sunday morning shows as he defended President Trump’s decision to exit the Paris accord on climate change. He clearly wanted to emphasize Trump’s interest in saving the beleaguered coal industry, which has lost market share (and tens of thousands of jobs) to the increasing popularity of natural gas. In fact, he used this statistic to rebut as “dead wrong” an interviewer’s question about whether Trump was making a “false promise” to the coal industry. But according to an EPA spokeswoman, Pruitt bungled the line on one show and did not accurately express it on other shows. (He kept saying “since the fourth quarter,” which sounds like the end of the year, when she said he meant to say since October.) But even if he had gotten it right, it still would have been deeply misleading. On “Meet the Press,” Pruitt flatly stated that almost 50,000 jobs have been added in the coal sector. Many readers asked about this claim, noting that there are only about 50,000 jobs in coal. Here’s the Bureau of Labor Statistics data on coal jobs. As you can see, it has been in a tight range for months, with a slight gain. In the last four months of the Obama administration, September to January, there was a gain of 1,400 jobs. In the first four months of the Trump administration, there has been a gain of 1,000 jobs, according to preliminary estimates. On the other programs, Pruitt more carefully referred to “mining and coal” or “coal jobs, mining jobs.” You can see how he tries to slip in the word “mining.” That’s a sign that this is a carefully crafted spin. He emphasizes coal while trying to be technically correct by slipping in a reference to mining. Here’s the BLS data on mining jobs. Of course, Trump only became president on Jan. 20, so it’s more appropriate to look at what has happened since January. That’s a gain of nearly 33,000. But BLS data shows about 75 percent of the jobs in the “support for mining” subcategory are in oil and gas operations. The plunge in oil prices that started in 2014 wiped out nearly 200,000 jobs in the oil and gas support sector by October, but a recent stabilization in oil prices has helped bring some of those jobs back. It has little to do with administration policy — and nothing to do with coal mining. We should note that coal industry officials believe the BLS figures for coal mining are too narrow because they do not include support personnel under “coal mining.” The industry would argue that the number should be about 62 percent higher — 81,000 rather than 50,000, as of the end of 2016. (An Energy Department report suggests the figure, including professional support jobs, is closer to 74,000.) That suggests coal mining support jobs represent about 11 percent of the “support for mining” total jobs. So perhaps 3,000 or 4,000 of the gain in support jobs could be attributed to coal, although the evidence suggests most of the growth is in the oil and gas sector. Even adding in another 4,000 jobs, Pruitt is only one-tenth of the way to the 50,000 jobs he touted on television — and which ended up in news stories. We don’t try to play gotcha, and it’s clear that Pruitt completely flubbed his talking point on one TV program. But he still uttered misleading spin on other news programs, trying to take advantage of the BLS job labels to suggest that there has been a huge gain in coal/mining jobs, in part by reaching back months before Trump came to the White House. The data is not made up out of whole cloth, but the claim is so tortured that it screams. Administration officials such as Pruitt need to learn they increasingly have little credibility when they try to manipulate government statistics in service of a dubious talking point. 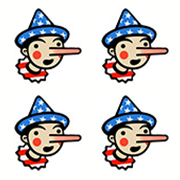 Pruitt earns four Pinocchios. “Since the fourth quarter of last year until most recently, we’ve added almost 50,000 jobs in the coal sector."